A mad, crazy week for me. This time of year is full of school events, Christmas parties, catch ups, and trying to get things organised for 2014. 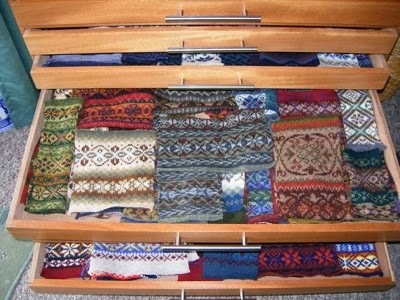 I’ll leave you with just a little snippet of fair isle knitting for to week. Wouldn’t you love to have a draw full of samples like these? I’d love to have them and get them out and look at how all the colours work together. These are from the Shetland Museum. Yes, it’s on my list of places to visit. One day!